The General ever desirous to cherish virtuous ambition in his soldiers, as well as to foster and encourage every species of Military merit, directs that whenever any singularly meritorious action is performed, the author of it shall be permitted to wear on his facings over the left breast, the figure of a heart in purple cloth, or silk, edged with narrow lace or binding. Not only instances of unusual gallantry, but also of extraordinary fidelity and essential service in any way shall meet with a due reward. For the first time, enlisted men were eligible for a major military award previously only given to officers. The recipients of the Badge of Merit were allowed to pass all sentinels and guards unhindered just like commissioned officers. They also had their names inscribed in a “Book of Merit,” which has long since disappeared. Historians have verified only three recipients of the Badge of Merit during the Revolutionary War, though it’s possible others may have received it as well (with the Book of Merit M.I.A., there’s no way to tell for sure.) Why so few soldiers were awarded the honor is unclear, but the best guess is that by 1782 the war was drawing to a close. Washington intended that the award be permanent, but the Purple Heart was all but forgotten until it was revived in the 20th century. Originally, the Purple Heart was only awarded to members of the U.S. Army for meritorious conduct during battle, just as the original Badge of Merit was. In 1942, President Franklin D. Roosevelt ordered that the Purple Heart be extended to all branches of the Armed Forces, and to those servicemen who had been killed in the line of duty on or since Dec. 7, 1941. 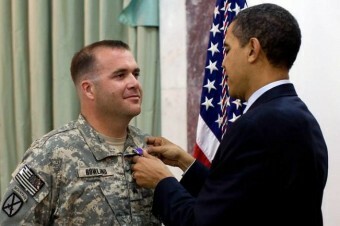 When the “Legion of Merit” award was created in 1942, which is given for meritorious conduct during battle, the Purple Heart became redundant, so its requirements were changed, and it is now awarded to any serviceman wounded or killed, or who died after being wounded in the line of duty.